October 23, 2008 – Thursday – We take a Noon flight to Xigera airstrip, and are met at the airstrip by the Xigera camp manager. He drives us a short distance to the launch point for the motorboat which will take us to Xigera Camp. The problem is the water level is so low, the boat driver has to gun it so we “fly” through the shallows. It is a thrilling trip! Xigera Motorboat Ride from JoeTourist InfoSystems on Vimeo. There are no cots to sleep on at Xigera Camp, so we have to sleep on the floor of the tents with a foam pad under us. There are only short drop toilets (no flush). There are almost no mosquitoes at the camp, despite Victor warning us they would reappear here. The reason things are more “rustic” at this camp is because there are no roads into the camp. 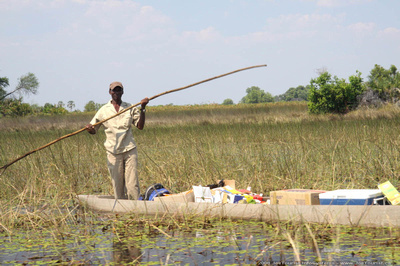 All camp fixtures and supplies have to be brought in by boat, and due to the shallow water, mokoros (dug out canoes) are the usual mode of transportation in this area of the Okavango Delta. We are staying at a tiny remote camp deep in the delta – some say this is the best water-based safari in Botswana. William is the local guide for this camp. He takes us on a walking safari at 5:30pm, and we see some Kudus. The camp staff setup a table in the savannah just outside camp, and serve us Sundowners. We have a wonderful lamb stew, rice & vegetables for dinner, and eat around the campfire. We don’t have a mosquito problem either night at this camp, probably due to the daytime heat and the evening breezes. This area of the Okavango Delta is permanently flooded and is very picturesque, however there are fewer big game in this area. The game are harder to approach, since safaris in this area are either on foot or in a mokoro (dug out canoe). Without the use of safari vehicles, it is not easy to find or get close to the animals. This doesn’t really concern me, since our time in Linyanti Camp, Lechwe Island Camp, and the Chobe River boat cruise have fully satisfied me for observing and photographing African big game. However if you are booking safari tours in Botswana, be sure to include camps in other areas of the Okavango Delta where safari vehicles can be used. October 24, 2008 – Friday – We are up at 5:30am for an early morning Mokoro safari through the waterways. We see a large family of baboons playing around in a big tree near the shoreline; Red Lechwe antelope bounding through the water; Kudu watching us from the shoreline; and we see crocodile tracks on shore and hear some Hippopotamus a short distance away from our mokoros. We return to camp by 9:20am – the Sun is already high in the sky, and the daytime heat is building. We have Brunch at 10:30am, then it is time for a siesta as the midday heat takes hold (about 40°C in the shade). All our tents are located under the shade of trees, so we are reasonably comfortable as we rest. Botswanan men normally keep their hair close cropped, but one strikingly handsome young Mokoro poler has about 1cm long curls. I saw Victor tutoring him as he poled us through the channels, so he is obviously studying to be a guide. Most camp staff take their careers seriously, with many studying so they can apply for advancement opportunities. The operator of the camps we used in Botswana is Wilderness Safaris, which appear to offer local people well paid careers in eco-tourism. 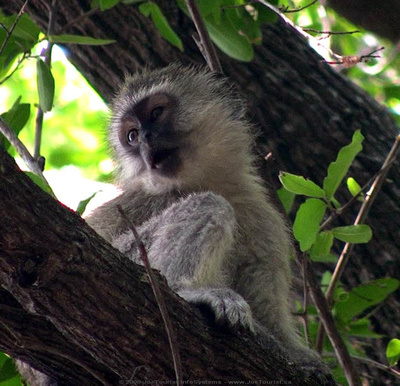 Later in the afternoon, I spot some very cute resident monkeys in the trees above our tents. They play peek-a-boo with me and my video camera. The camp staff have done a wonderful job of keeping all the food out of the way, and not tempting the monkeys to come down from the tree canopy. We have no problems with the monkeys as a result. We go on another mokoro safari through the waterways between 5:30pm and 7pm, and see some birds, a very colourful Reed Frog, and some elephant bones on an adjacent island. Xigera Mokoro Okavango Safari from JoeTourist InfoSystems on Vimeo. October 25, 2008 – Saturday – We get up at 5:30am for one last early morning safari before we leave camp. This time we walk, and see two sets of Leopard tracks, Elephants in the distance, and some Impala on the savannah in the middle of the island we are located on. We leave camp at 12 noon on the motor boat – once again zipping through the shallow delta water at full throttle. It is just as thrilling as our arrival trip! We spot a Giraffe sitting down in the bush and resting (a first), and we also watch brown-striped Zebras graze beside the Xigera airstrip before we board the last local flight we will take in Botswana – flying from Xigera to Maun.